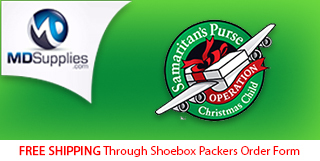 I have finished packing my Operation Christmas Child shoeboxes for the 2017 packing season except for needing sew some skirts to include. So I am beginning to move on to 2018 shoeboxes. One of my shoeboxes for 2017.
packing them thru the year. 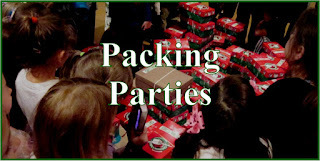 Instead of using our family's shoebox packing budget, I am trying to earn money specifically for my girls' shoeboxes. 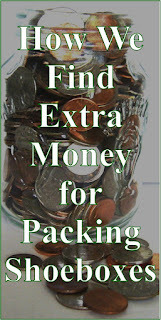 I hope this will enable me to pack higher quality boxes as well as fund my craft supplies with fun additions. It will also give Sarah a little extra in her packing fund for the year as she won't have to pay for my items. 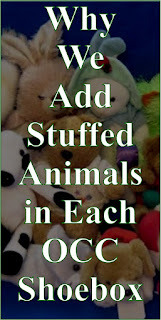 We always include a stuffed animal in each OCC shoebox we pack. And my daughter discovered that our local Hospice Thrift store is a great place to find them--they have lots with tags still on. She checks almost every week and usually finds some for 25 to 50 cents a piece. At the beginning of the month her and Sarah stopped in and the bins were overflowing. They purchased over 30 and I chose these for my shoeboxes for 2018--$4.00. I know the one tiger is not Tigger, but we can pretend. Also, we are calling the elephant an Heffalump. Most of these stuffies are a little larger than most of my family includes, but I love to squeeze a larger friend into my 2 to 4 year old girl shoeboxes so I was excited to pick these out of the bag. Some of these are Webkinz and the Poohs & Tiggers were chosen by the girls for me specifically as I love the original Winnie The Pooh stories; and read them repeatedly to the girls when they were young. I will be making library bags with Pooh fabric to include. I already have these two made from fabric on hand. 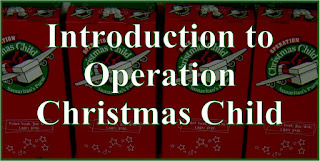 The second thing I have already purchased is a dozen of the new Operation Christmas Child plastic shoeboxes--$26.25. They are a gift in themselves. They are super sturdy. The little gal can keep her treasures in it for a long time to come and the library bag will give her something to carry a few of her favorites or her school supplies with her when she goes. My only concern is that the lids fit quite tightly and she may not be able to open it by herself. 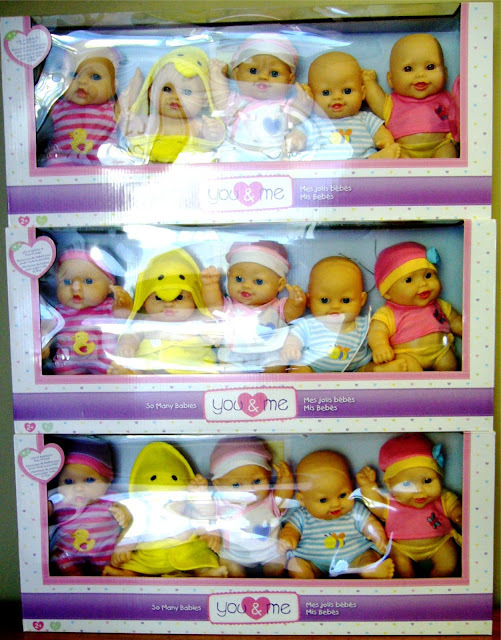 And a huge splurge, and something that will increase the number of shoeboxes I will probably pack, are these dolls. 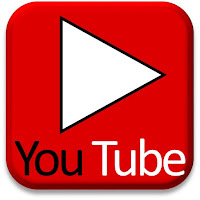 Clip with Purpose Facebook page shared about some Dollar Tree dolls and a follower left a link to Toys R Us dolls in a comment. They are regularly $19.99 for the five pack, but they were on sale for $10.00 a set. And free shipping was at $29.00 so I just had to order three packs [$30.00]. So I either have to pack more shoeboxes or save some for future years. I was disappointed that the skin was so light. The picture by the description I was reading on the Toys R Us website was showing it much darker, but it did say colors could vary. Oh well, they are still adorable. 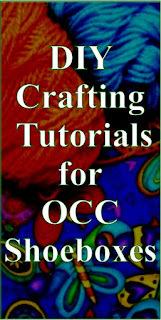 I will be sewing or crocheting blankets and clothing and include a tiny stuffed animal with each. 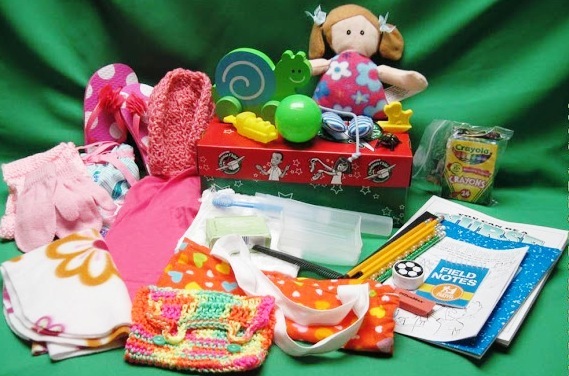 And Sarah has claimed one of them with a duck on the outfit and one with a butterfly to make themed shoeboxes around. 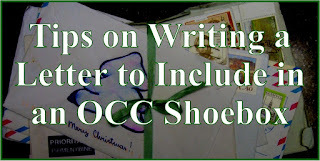 And a deviation from the girls' shoeboxes, a little boy shoebox sneaks in. Since I want to sew a little shorts set for a 2 to 4 year old boy shoebox to enter in the fair next year, Sarah picked up some Dollar General clearance items for me to go with it and build a Cars theme box--$2.25. She thinks I will need to make two shoeboxes as this may be too much for one shoebox. One way I've earned some extra cash this month was by entering some of my items I've sewn for shoeboxes in our local county fair. I entered three items and won first on two of them (let's just say the competition at our fair has dropped off in the last few years). I won $12 in premiums and Elizabeth won $4 which she donated to my efforts. These two items went into boxes this year as did the other three things we entered. Below are my income and expenses for the month. I spent more than I earned, but most months this should not be true--let's hope so anyways. 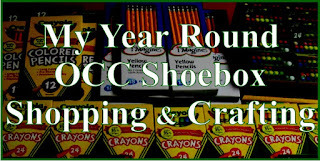 *If you are interested in how I earned this money with a few minutes online each day you can see the details in this earlier post: How I Fund My OCC Shoebox Crafting Habit. I believe I'll start with these two little guys and the two bags above as seeds in my first two Operation Christmas Child shoeboxes for 2018--can't wait to see the items in the shoeboxes grow to fill them up. 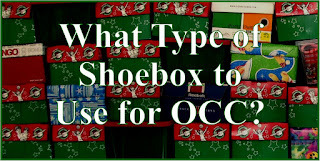 Do you have an OCC Shoebox packing plan for 2018? 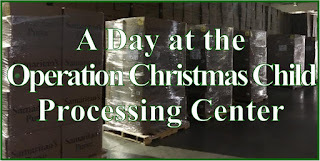 Do you take a break over the holidays after collection week or do you jump right back in? 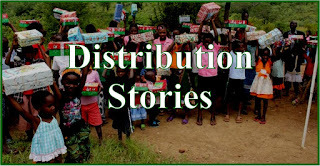 If you are interested in why I do the 2 the 4 year old girl Operation Christmas Child shoeboxes check out this earlier post: Packing OCC Shoeboxes for Girls Verses Boys: Why I Sew Dozens of Dresses. 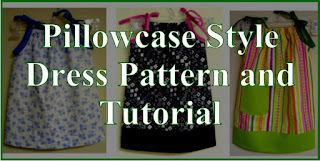 I love how organized you are and look forward to following along all year! 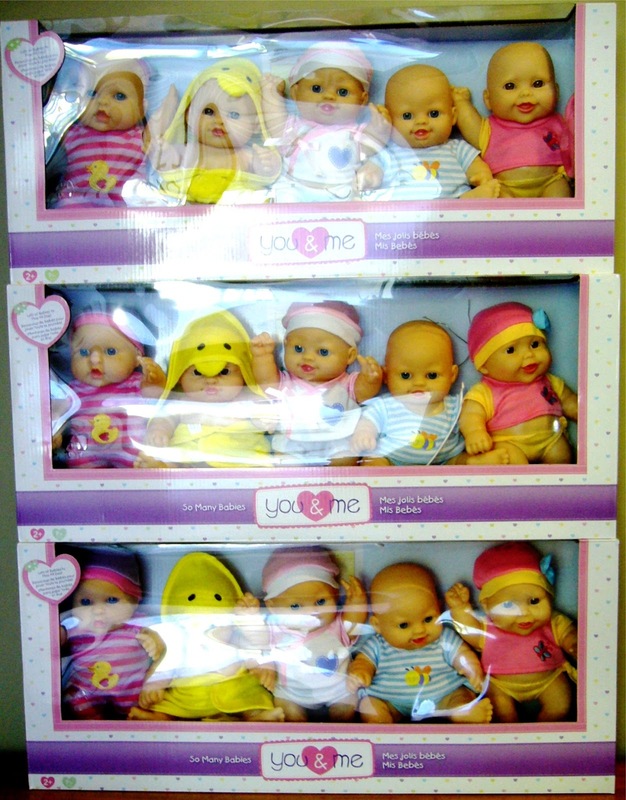 **So happy you bought the Toys R Us baby dolls! I posted the comment on Clip With Purpose hoping that others would get some! Unfortunately it wasn't in my budget at the time, but I'm just happy that someone got some! Andrea, I am excited you shared about the dolls! Thank you for taking the time to share them. I can't wait to design clothing for them. 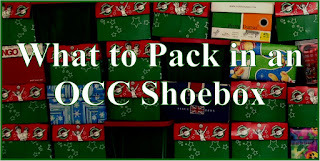 I'll be glad to have you joining me on my shoebox journey this year. I hope I stay organized!! I'm great at organizing at first, but then it often falls apart. Happy Packing!